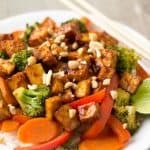 A tofu recipe that's actually delicious! Wrap tofu in a several paper towels and set a plate on top to press out excess liquid. Once dry, unwrap tofu and cut into very small cubes (about 100 pieces). Spread out evenly on the lined baking sheet and bake for 25 minutes, until puffy and slightly crispy on the edges. Meanwhile, add 1 tablespoon of sesame oil, soy sauce, molasses, peanut butter, lime juice, and Sriracha to a small bowl and whisk until incorporated. Set aside. Add baked tofu to the sauce and let marinate for 5-10 minutes, stirring occasionally. Heat a large, nonstick skillet over medium heat. Once hot, add the tofu and about 3 tablespoons of marinade. Cook for about 5 minutes until browned and caramelized, stirring frequently. Remove from pan and set aside. Add remaining marinade, broccoli, and carrots to the skillet. Cover and cook for about 4-5 minutes (until carrots are slightly tender), stirring occasionally. Then remove lid, increase heat to medium-high, and add red bell peppers. Cook for 1-2 minutes more, stirring frequently, then remove from heat. Serve veggies in a bowl on top of white rice. Top with the caramelized tofu and crushed peanuts. Enjoy!